"Taking Sides" is an English as a second language text to help advanced and intermediate students master speaking skills, acquire new vocabulary, and improve reading and writing. 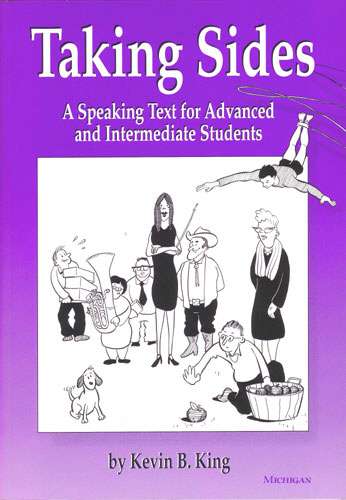 Designed as a speaking and discussion book for the classroom, the text allows students to exchange ideas on important issues by providing a reading passage or framework from which those ideas can be honed. Activities increase students' fluency in speaking as well as their understanding of issues relevant to current American culture. The book contains an introductory exercise and six sections--ethics, psychology, philosophy (distributive justice), law, linguistics, and business negotiation. Within these chapters, students are given practice in how to state opinions, compromise, build consensus, speak persuasively, understand group dynamics, write memos, make presentations, engage in debate, and negotiate. Students are also exposed to general conversation cues, cross-gender and cross-culture communication issues, and the American political arena. Unique to the book is the interest stimulated by innovative approaches to common tasks, such as asking students to create a health care system. Author Name: King, Kevin B.